I shot this in early 2011 in the Mesquite Sand Dunes at Death Valley National Park. I was never able to process it to my satisfaction so put it aside in favor of a similar photo taken at a different angle and with a narrower view. The other photo is simpler, but I like this one better because there's a lot going on -- but not too much. The footprints at left, the woman at right, the line of the lower dune cutting across the higher one, the first horizon line at left, followed by another at the base of the mountains and then the ridge line. It's a lot -- maybe too much -- but manages to balance out. I also like the photo because it's different. The Mesquite Dunes are extremely popular, yet this photo manages to be somewhat unique. I took another crack at processing today. This is the best version I've done yet. It was very late afternoon, approaching the sunset, and the mountains really did take on a purplish hue. I have no idea who the woman in the photo is. 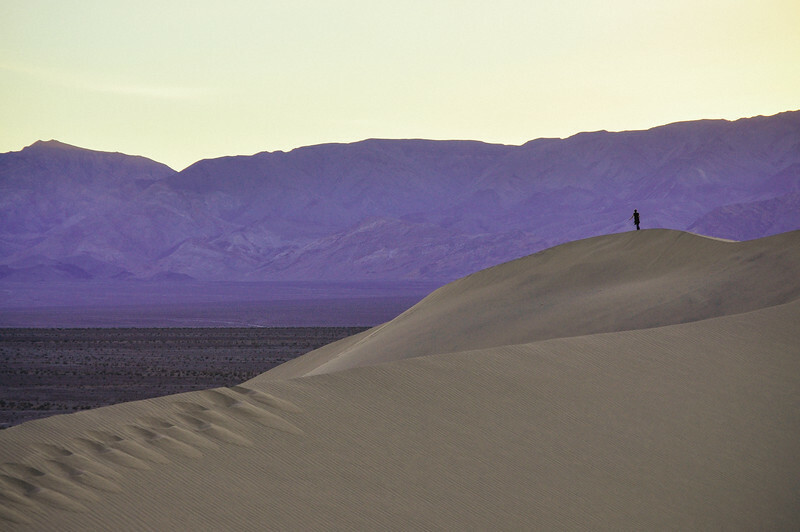 She was hiking and I happened to have a 55-200mm telephoto lens on my camera -- she served as the perfect counterpoint to show how little people are in the immensity that is Death Valley. The image works in black and white, too. It would be even stronger if there had been some clouds that day but it was unmercifully clear out. Camera & Settings & Processing: Nikon D5000, Nikon DX 55-200mm lens. Shot as a jpeg and processed today in Lightroom using VSCO slide film presets (they work with jpegs but use the standard film tools, not the ones oriented toward particular camera brands). If you love the color version, buy a print here! (And here for black and white). SmugMug does a nice job through Bay Photo and prints are very modestly priced. I pump any money I make back into my photography (read: the Nikon D7100 I think I want to buy). P.S. If you're interested in joining SmugMug, click here for a $5 discount.